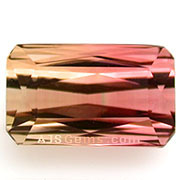 Tourmaline has become one of the most popular of all colored gemstones. Buyers are attracted by its huge choice of colors and its very good gemstone characteristics -- tourmaline is reasonably hard (7 to 7.5 on the Mohs hardness scale), and durable enough for all kinds of jewelry. High quality pieces have excellent transparency and an attractive vitreous luster. It is also a very affordable gemstone, particularly in larger sizes, since the per carat price for tourmaline doesn't increase radically with size like the prices for sapphire and ruby. Tourmaline, like corundum, spinel, beryl and quartz, is colorless when pure. It is the presence of small quantities of one or more coloring agents than give these gems their distinctive colors. Gems with this property are known as allochromatic. It is typically elements with atomic numbers in the range of 22 to 29 that cause the distinctive colors: titanium, vanadium, chromium, manganese, iron, cobalt, nickel, and copper. Tourmaline seems to be particularly susceptible to absorbing trace elements during its formation. 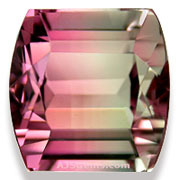 Pink tourmaline, resulting from the presence of manganese; and green tourmaline, resulting from iron, are the most common. Some tourmalines provide a visual record of their crystal growth by displaying two or more areas of different color. These are known as bi-color or tri-color tourmalines. Most often they feature a combinations of pink and green or some variation. The color range is quite wide, ranging from orange to purple to brownish-pink and blue-green to apple-green. The most famous multi-color tourmalines are referred to in the trade as watermelon tourmaline, since they combine pink or red with green, sometimes with a thin white area separating the colors. 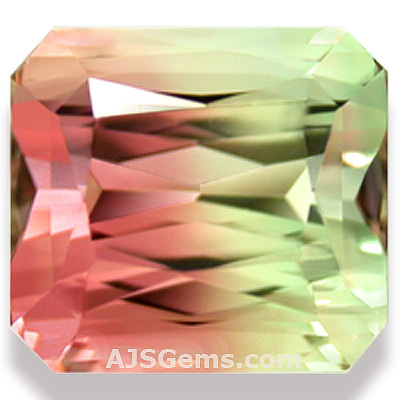 Sometimes these watermelon tourmalines are cut as slices, with a pink core and a green rim. 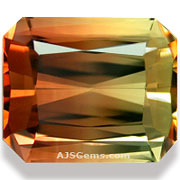 Clean material is usually faceted in long rectangular shapes, with an emerald or scissor cut. Note that the term watermelon tourmaline is mainly a trade name, and reports from gemological laboratories will typically identify these stones as "bi-color tourmaline." Bi-color tourmalines are found in most of the tourmaline deposits in the world, including Brazil, Nigeria, Madagascar, Afghanistan and the USA (California and Maine).